Oocyst Mutant oocysts numbers in Anopheles stephensi, counted at day 10-12 post infection, were slightly lower than those produced by wild type parasites and the size of mutant oocysts at day 10-12 was significantly smaller compared to the size of wild type oocysts with a maximum size that is comparable to immature 6-8 days wt oocysts. The mutant lacks expression of glutathione reductase (GR). In this mutant, Δgr4, the complete gr gene was replaced with the hdhfr/yfcu selectable marker cassette. See RMgm-403 for an independent mutant (Δgr3) lacking expression of GR. In this mutant a ~700 bp region of the gr gene was replaced with the hdhfr/yfcu selectable marker cassette. Plasmodium species have a fully functional glutathione (GSH) redox system. GSH is synthesized by the sequential action of gamma-glutamylcysteine synthase (γ-GCS) and GSH synthase; both of the genes encoding these enzymes are present in the Plasmodium. In addition, GSH is generated by recycling GSSG back to GSH via glutathione reductase (GR). De novo synthesis of GSH is not essential for survival of P. berghei blood stages. Blood stages of parasites lacking the enzyme γ-GCS (Δγ-gcs; RMgm-204) showed only a minor reduction in growth rate compared to wild type parasites. In contrast, Δγ-gcs parasites show a complete block in oocyst development and were unable to produce infectious sporozoites. These results indicate that de novo synthesis of GSH is pivotal for development in the mosquito. The phenotype analyses indicate that GR is not essential for blood stage development. In contrast, a dramatic effect of the lack of GR expression was observed on development of the parasites in the mosquito. Infection of mosquitoes resulted in reduced numbers of stunted oocysts that did not produce sporozoites. Through disruption of the gene encoding γ-GCS it has been shown that de novo GSH synthesis is not critical for P. berghei blood stage multiplication but is essential for oocyst development. The phenotype analyses of mutant parasites lacking expression of GR confirms that GSH metabolism is critical for the mosquito oocyst stage. Attempts to generate parasites lacking GR and γ-GCS by simultaneous disruption of gr and γ-gcs were unsuccessful (see 'Additional Information'). This demonstrates that the maintenance of cytosolic GSH levels required for blood stage survival is dependent on either de novo GSH synthesis or GSSG reduction by Plasmodium GR. Parasites lacking GR showed the same sensitivity to methylene blue and Eosin B as wild type parasites demonstrating that these compounds target other molecules than GR. In order to examine whether blood stage parasites can survive without de novo synthesis of GSH and without a functional GR attempts were performed to disrupt the γ-gcs in a mutant lacking GR expression. For these experiments the ∆gr3 (RMgm-403) mutant was generated which lacks a drug-selectable marker to enable us to take advantage of the γ-gcs disruption construct which contains the tgdhfr selectable marker (RMgm-204). The drug selectable marker, a fusion of the hdhfr and yfcu genes, was removed from the genome by negative selection with 5-fluorocytosine. 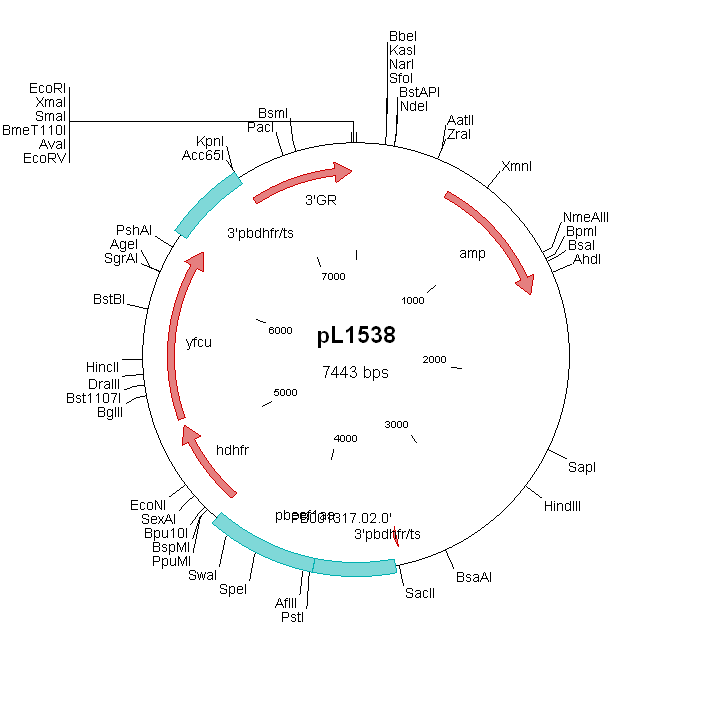 Three attempts to disrupt the γ-gcs gene using two different constructs (pL1217, pL1223) in the ∆gr3 mutant were unsuccessful whereas wild type parasites were readily transfected with the same constructs (RMgm-204). In addition, attempts were performed to disrupt the gr gene in γ-gcs mutants (∆γ-gcs1,2; RMgm-204) with construct a construct containing the hdhfr as a selectable marker, allowing selection of mutants using treatment with WR99210. In 5 attempts it was not possible to select parasites with both the γ-gcs and the gr genes disrupted. These results indicate that the maintenance of cytosolic GSH levels needed for blood stage survival requires either de novo GSH synthesis or the formation of GSH through reduction of GSSG by a Plasmodium GR. These results also strongly suggest that blood stage parasites cannot depend solely on host-derived GSH and GR for their GSH metabolism. RMgm-403: An independent mutant lacking expression of gluthatione reductase (GR). In this mutant, Δgr3, a ~700 bp region of the gr gene was replaced with the hdhfr/yfcu selectable marker cassette. The mutant does not contain a drug selectable marker which has been removed by the negative selection procedure using the negative selectable marker yfcu (yeast cytosine deaminase and uridyl-phosphoribosyltransferase) and the drug 5-fluorocytosine (5-FC)(Braks et al., 2006, Nucleic Acids Res 34, e39). RMgm-204: A mutant lacking expression of gamma-glutamylcysteine synthetase (γ-GCS).